wow. that bio was old. I'm not exactly 25 anymore. And I'm working on baby number four. And now Im in Arizona. I think my fanfic career is on indefinite hold. Sorry. But my writing career is just beginning. 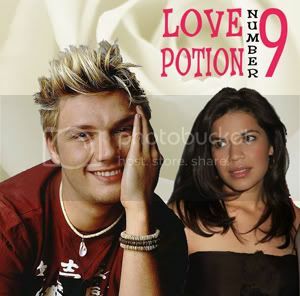 Pop-music's hottest prince and Suburban America's most average girl unknowingly fall victim to a powerful love potion. Nine days later he wake's up in Tahiti completely in love with his new wife, while she wakes up next to him with no memory of any of it. Summary: Nick's life is falling apart and he feels powerless to stop it. He's haunted by a past relationship, he's on the outs with his best friend, and most of all he doesn't have the heart to keep singing but he's too afraid tell the guys he wants to quit. When Rachel strolls into his life, she makes him believe he has the strength to stand up for himself, but he soon learns that love isn't always the answer you're looking for. Sometimes you have to find it within yourself. Summary: A tribute to Howie's 35th brithday and my Response to Rose's challenge for the August challenge on the AC boards! CHOOSE YOUR OWN ADVENTURE and find out how much trouble you can get into when the guys surprise you with a five-boy birthday all-nighter!